Jaguar struggled for many years under Ford to re-establish the foothold in the performance luxury market they had had in decades past. Equally famous for its race cars as its sedans, the British company quickly – but perhaps rightly so – lost favor to manufacturers like Mercedes-Benz and BMW. However, the end of Ford’s ownership and the transfer to Tata signaled a revival for the iconic brand, and seemingly in celebration they launched the XF. Suddenly, Jaguar was back in business. The XF sedan featured gorgeous exterior lines, a low-slung body style and enough trimmings inside to keep the most discerning customer satisfied. But more importantly, it drove well. In short, it is the best Jag to hit the U.S. market in ages. It seemed there was only one thing that could improve upon it: the creation of an R model. And so Jaguar plonked a supercharged V-8 engine behind the blunted nose, added sill extensions and front air intakes, included even more luxuries within the cabin and sat it all atop 20-inch wheels. The XFR rockets to 0-60 mph in just 4.7 seconds thanks to 510 horsepower and 461 lb-ft of torque. It’s an exceedingly fun drive and an exceedingly elegant sedan. If this is the new Jaguar, we’re 100 percent on board. Just let us sit behind the wheel. All features are included in the $80,000 price tag – suede headlining, navigation system, formidable Bowers & Wilkins 440W surround sound system – and because of this, the XFR instantly achieves a high level of comfort for driver and passengers alike. The sedan handles exceptionally well, and while power is on the intense side, it never feels overwhelming or out of control. Most controls are hidden within the touch screen system. While the configuration makes the dash look clean, it can be a bother when you’re quickly trying to adjust the seat heaters or just want to change to satellite radio. The XFR also excels at gas-guzzledge. Be prepared to see numbers under 10 mpg if spirited driving ensues. And trust us, it will. The V-8’s deep rumble presents itself upon start, and power feels almost limitless as you careen around corners and speed down the highway. Press the checkered flag-adorned button on the dash and Dynamic Mode engages, giving the big cat an abundance of torque delivery and more aggressive responses. Stability control won’t let you put a foot out of place, but you’ll find it doesn’t limit the car too terribly either. Driving purists will find the electronically-controlled differential and standard six-speed automatic transmission instead of a manual somewhat of a letdown, yet the paddles let you choose gears with almost complete control as the car rockets to 60 mph in just 4.7 seconds. We had to repeatedly remind ourselves we were, in fact, driving a sedan. Should you ever want to slow down, 15-inch rotors make braking a swift and smooth procedure. Slick looking seats with power side bolstering hold both driver and passenger in place, and the suspension is perfectly suited to the car’s mass, power output and handling abilities. But don’t let all this talk of power and dynamics fool you, the XFR is actually quite docile when it needs to be, which makes daily driving a pleasure. Steering always feels easy, never touchy or a chore, and damping swallows road bumps effortlessly. This is what we’ve been waiting for from Jaguar. Do we dare call it purrfect? 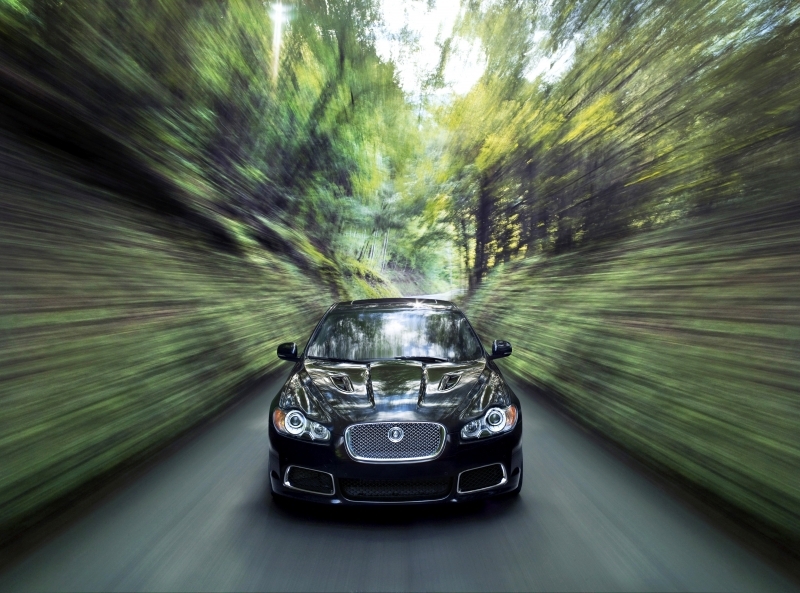 A 5.0-liter supercharged V-8 engine motivates the Jag along the road while producing 510 horsepower and 461 lb-ft of torque. Power is put down through the rear wheels via a silky-smooth six-speed automatic transmission with paddle shifters. Sport Mode can be engaged and stability control can be turned off if necessary. As mentioned before, this is an all-inclusive type of purchase. Suede headlining, seat heaters – and seat coolers for that matter – electronic side bolsters and a killer sound system (that’s 13 speakers and a subwoofer, ya’ll) are all part of the listed MSRP. The touch-to-open glove box and touch-sensitive overhead lights are other dashes of elegance that will conveniently provide entertainment for those with the emotional age of five. Most of the controls for the navigation system, audio system, HVAC and trip computer details are all located in the touch-screen system in the center of the dash. While we like the ease of access and resulting simplicity of the dash, the menus can run fairly deep and it takes too many touches to reach certain basic controls. Technology related to the drive fares better, like the speed-adjusting adaptive cruise control. This is not a car for the fuel-efficient minded. Rated at 15 mpg city and 21 mpg highway, fuel consumption is pretty high. The small 16.1-gallon tank won’t help your cause any either. Dark oak and mesh aluminum make up the hard surfaces in the cabin, while the rest are covered with supple leather in a variety of colors. We’re partial to the red and black leather seats with red stitching. Rear headroom, as it often is with these coupe-like body styles, will be tight for those over six feet. The JaguarDrive Selector – a knob that takes the place of a more traditional gear lever – emerges from the dash when the start button is activated, a feature that doesn’t fail to wow us every time. 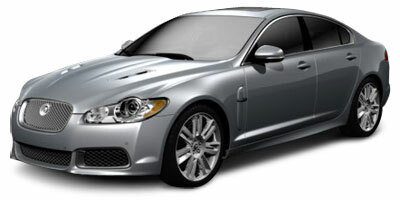 Jaguar wanted the XF to look sleek, fast and modern, and they certainly nailed it with the design. A cat-emblazoned front grille is squared-off to the wrap-around headlights and the bodylines transition into a small rear spoiler, curving upward away from the rear lights. The XFR has a number of modifications to the exterior, including quad tailpipes, 20-inch Nevis wheels and body-colored sill extensions. Those added hood vents are actually functional too, feeding air into the supercharger. With an $80,000 price tag, the V-8-powered XFR is up against some horsepower-heavy competition. Cross-shops include the slightly more expensive $85,500 BMW M5 and $88,575 Mercedes-Benz E63 AMG. We’d also recommend taking a look at the Cadillac CTS-V as well. At $58,575, it has more power than the XFR, but costs $20K less, presenting a very tempting alternative. We find ourselves rooting for Jaguar to succeed, since for so long they’ve had more misses than hits – a trend that clearly couldn’t continue. With an eye for detail and thorough dedication to all things sophisticated and powerful, the XFR is a hit in a million and one ways, making Jaguar two-for-two since late 2008. By creating an R version of the XF, Jaguar is firmly putting its spotty past behind it and reassuring its loyal buyers that it is indeed building better cars. Still having doubts? Just wait ‘til you lay eyes on the new XJ.